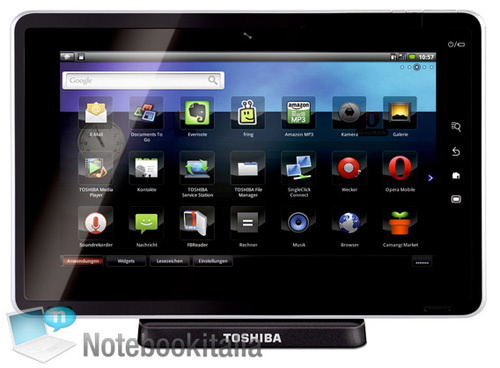 Remember that SmartPad from Toshiba that we told you about last week? Well, it’s back, with a new name and some killer specs. Its name is no longer SmartPad, although that name will likely continue on as a hook for other Toshiba tablets, like the Droid line on Verizon. Toshiba is calling this beauty the Folio 100, and judging from the specs and picture above, I’d say we just found our poster tablet to go up against the iPad. The Folio will run Android 2.2 (Froyo), sport a gorgeous 10.1-inch, 1024 x 600 multitouch widescreen display, 16GB of internal storage, a Tegra 2 processor, a 1.3MP webcam, 802.11 b/g/n WiFi, Bluetooth, 3G, HDMI and USB 2.0 ports, along with an SD card reader (up to 32GB). The Folio also brings a 1020mAh battery that boasts up to 7 hours of battery life with mixed use to the table. I know you’re thinking: “What’s the browser like?” Well, it just so happens that the Folio runs Opera Mobile with Flash 10.1 (yeah, we said Flash 10.1). Other specs include a PDF reader, an eBook reader, and an RSS aggregator. Nothing has been confirmed as of yet, but it’s rumored (and highly likely) that Toshiba will unveil this bad boy at IFA, along with a price tag. This is big news, considering that the Folio’s only real competition at the moment is the Samsung Galaxy Tab. I don’t know about you, but I know what’s going on my Christmas wish list! Anyone else excited about this tablet?